Yellowstone National Park has become one of the most popular destinations in America as streaming caravans of tourists make their way to the rugged sight. 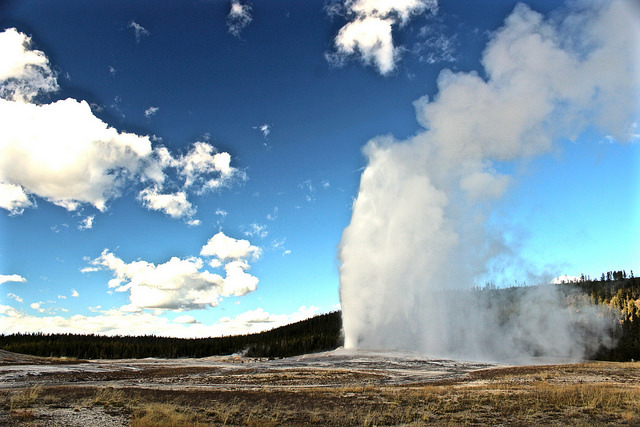 In fact, Yellowstone is the fourth most visited national park, with over 4 million visitors per year crowding into the park and clogging the roads. As the National Park Service celebrates its centennial this year, Yellowstone is even more in the news. 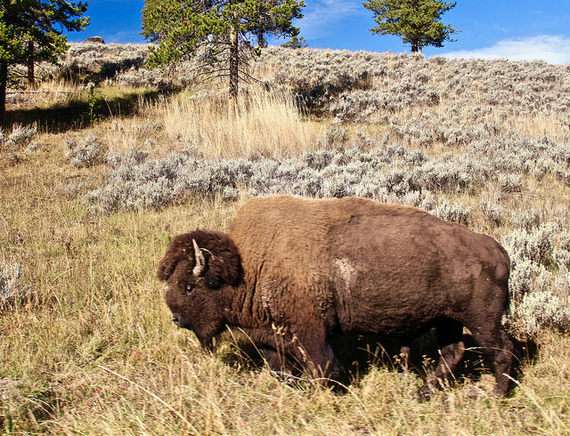 But Yellowstone is magical -- and relatively empty -- in the fall, a season that's perfect for snuggling up to a warm fire in the lodge and donning the first cozy sweater of the season. The park itself is aflame with the blazing leaves of quaking aspen, maple, and cottonwood trees turning a brilliant yellow, and moves at a more languid pace. Without all summer visitors, it follows the lead of its grizzly bears and starts settling down for a long winter's slumber. We visited in early October, just a week before most of the park closed for the year. 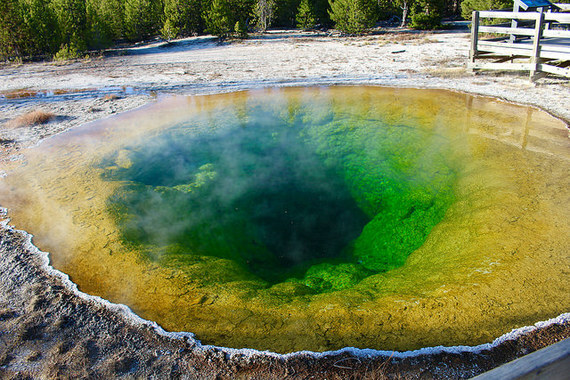 This off-season period is the perfect time to enjoy the sights that make Yellowstone justly famous, without struggling for elbow-room while you do so. Many of the park's lodging options have also closed for the season by this point, so unless you reserve months ahead at one of the few lodges still open, you'll have to stay outside the park. 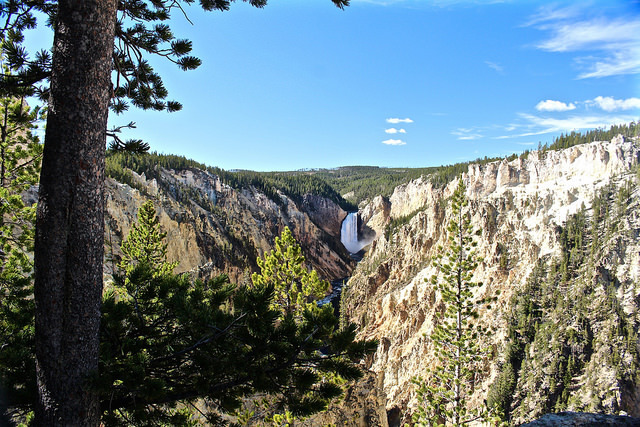 Fortunately, there are several routes to take into Yellowstone, with the towns nearby each offering their own flavor of Western life. We approached Yellowstone from the east, passing through Cody, Wyoming located fifty miles from Yellowstone's East Entrance. 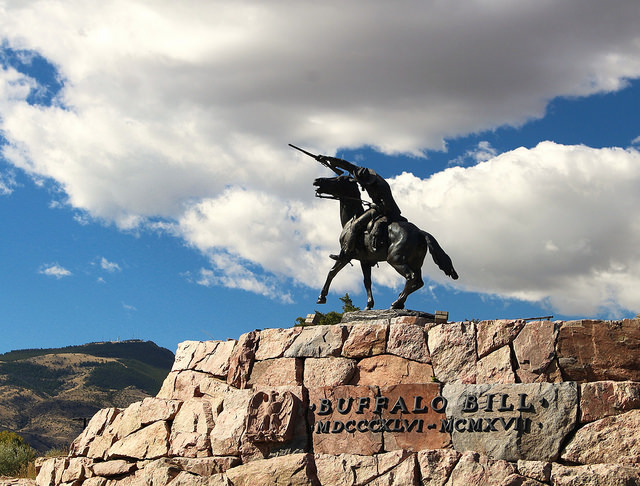 The town, founded by "Buffalo Bill" Cody, offers the spectacular Buffalo Bill Center of the West, a member of the Smithsonian Affiliations program, it offers five national-caliber museums under one roof covering natural history, firearms, the local indigenous people, Western art and Buffalo Bill himself. Note: The above photo was taken with a zoom lens. Do not get close to the animals! Driving through Yellowstone itself took us past stunning vistas for which the park is justifiably famous. With virtually no one else on the road, we were able to explore at leisure. Occasionally, we'd spot a few cars pulled over by the side of the road, a familiar signal that there was wildlife in the vicinity to view. The bison proved particularly photogenic, especially when they chose to stop in the middle of the road and not budge for several minutes. We hadn't seen any elk... until dusk. Dozens of them crossed our path as we were leaving the park just after sunset. We bunked in for the night in the tiny hamlet of Gardiner, Montana, which sits just across the state line at the park's Northern Entrance. Gardiner gives visitors a glimpse of life in days gone by, with only a few buildings and small motels lining the streets, many of which are unpaved. Later that night, that same herd of elk paid us a visit, moseying down the streets of Gardiner as if looking for their own room for the night. 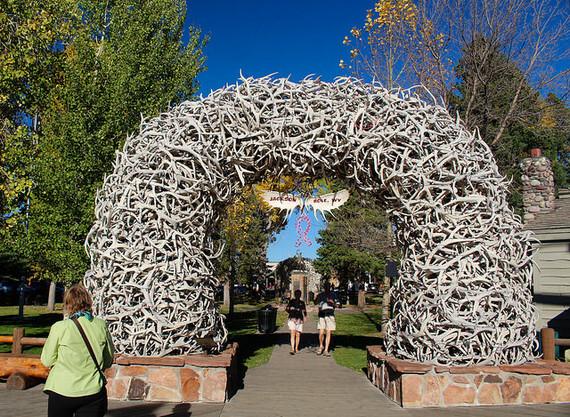 From the southern approach, the town of Jackson offers the most sophisticated taste of the West near Yellowstone National Park. The village is located in the valley of Jackson Hole about 60 miles south of the park's South Entrance, a drive that passes through Grand Teton National Park, with its breathtaking views of those rugged peaks. Jackson attracts high-end visitors who seek comfort mingled with a dose of ruggedness in their travels, which might explain the moose calf ambling along the side of the road as we drove into town. Spring Creek Ranch, perched high above the valley with the Grand Tetons in the distance, made Michael observe that the town had come a long way since his first visit as a child 40 years ago, when the airport gates were literally two wooden gates, like you'd find in someone's backyard. If you're determined to see Yellowstone, go in the fall to truly enjoy your visit. Larissa and Michael Milne have been full-time global nomads since 2011. Follow the journey and pick up travel tips on their blog at Changes in Longitude.